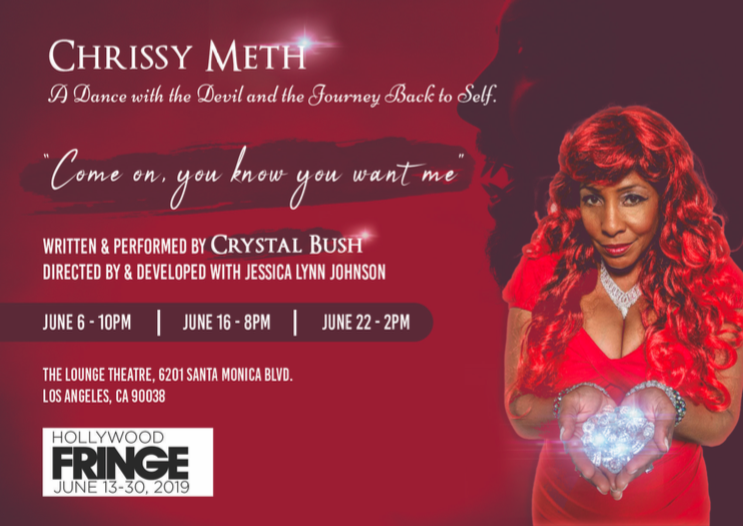 CHRISSY METH: A Dance With The Devil & The Journey Back To Self is a solo show written & performed by by Crystal Bush with direction & development by Jessica Lynn Johnson. It centers around a motherless child “Crystal” who grows up in the western suburbs of Chicago, she finds herself stumbling from one abusive relationship to the next, pushing her into a deep drug addiction. Somehow, from the depths, of being lost forever, she finds hope and begins to put the pieces back together. Through the use of song, multimedia, humor and multiple characters, she explores, questions and challenges beliefs and social mores surrounding identity, and self esteem while showing that it’s never too late to comeback and find one’s self-worth. CHRISSY METH at Hollywood Fringe! !